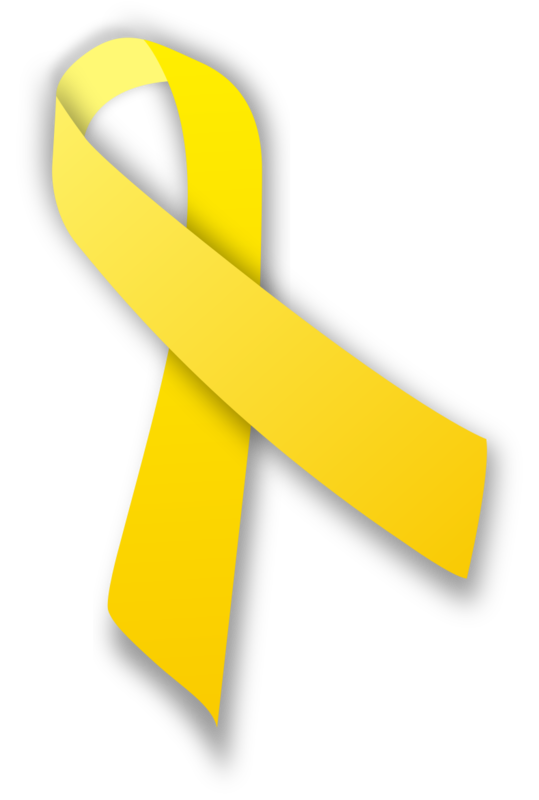 If you know of a volunteer, are a volunteer, or value the commitment made by Rural Fire Brigades; on Tuesday 16th October 2018 wear a yellow ribbon to show your support. Through this you will be giving your visible support to those who wear the yellow coat and ride the yellow trucks. This year Yellow Ribbon Day holds special significance for all firefighters as the 2018 bushfire season is testing the strength and resolve of all firefighters; full time, part time and volunteer. 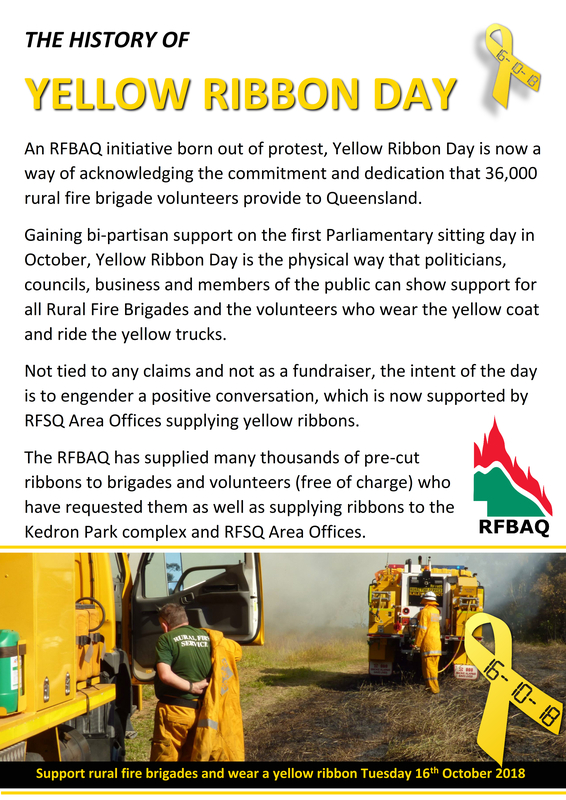 The RFBAQ will send every State Member of Parliament a yellow ribbon, as Tuesday 16th is the first sitting day in October and this is a visible way for MP's to show their support for the volunteer firefighters and brigades that are currently out protecting communities across 93% of Queensland. 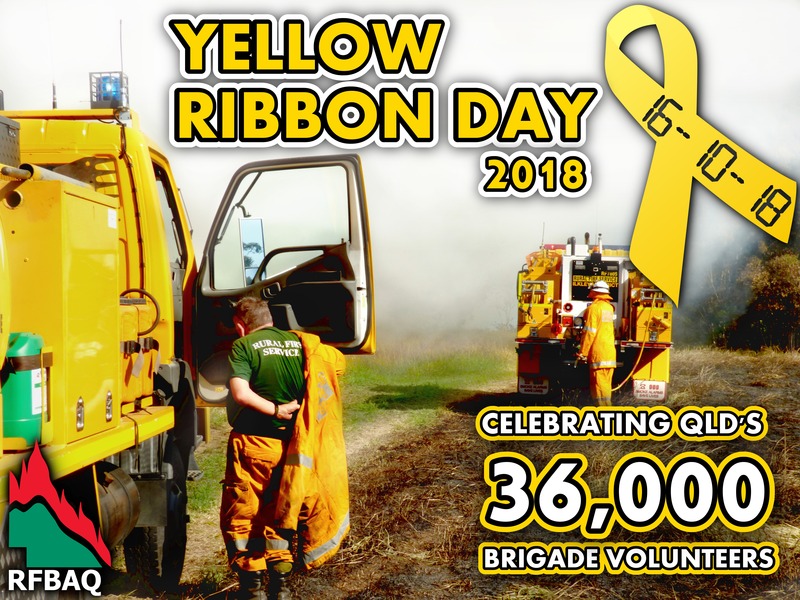 An RFBAQ initiative born out of protest, Yellow Ribbon Day is now an annual event to acknowledging the commitment and dedication that 36,000 rural fire brigade volunteers provide to Queensland. Bushfire, Flood or Cyclone - the 1,440 Rural Fire Brigades across the State protect all communities from disaster. This year's event is already shaping to be bigger and better with businesses, brigades and MP's again getting on board. 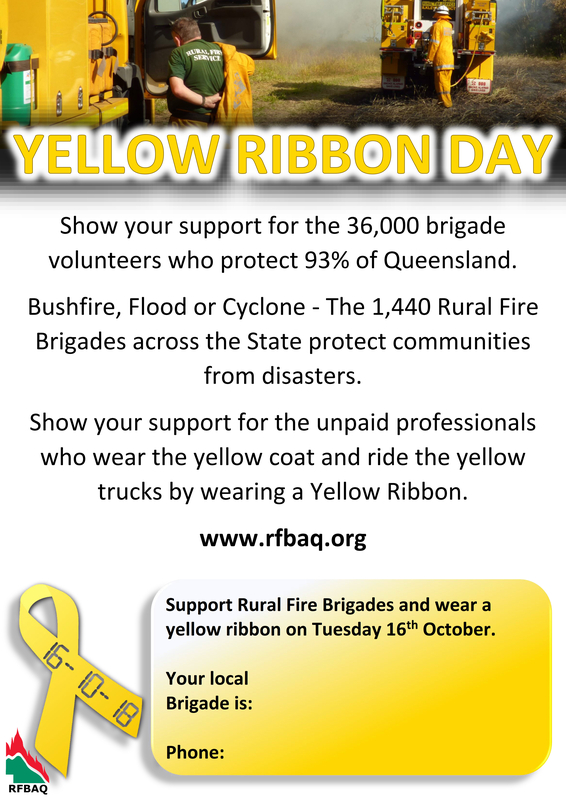 If your business or brigade is holding a yellow ribbon awareness day then send your pictures in to RFBAQ. To support brigades and volunteers spreading the word on what they do in defending their communities, the RFBAQ are now supplying Yellow Ribbon Day Brigade Information Kits. Click here to fill in a Yellow Ribbon Day Brigade Information Kit request form or email the RFBAQ ensuring that you have your brigade name, contact person details and of course a mailing address. Click the thumbnails below for larger posters and an email signature!